Be the first to share your favorite memory, photo or story of Joan. This memorial page is dedicated for family, friends and future generations to celebrate the life of their loved one. 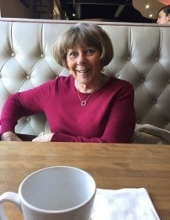 Joan Elizabeth Gibson (nee Kreiter), age 77, a longtime resident of Naperville, passed away on February 1, 2019 in Naperville. She was born on December 4, 1941 to the late Marjorie and Otto Kreiter. Joan is survived by her husband, Ron; her siblings, Brad (Sonja), Barbara (Ben), and Pam; her children, Greg (Kathy), Brett (Lisa), and Beth (Chris); her four grandchildren, Grace, Blake, Beau, and Lexi; and her granddog, Herbie. She grew up in Earlville, IL, where she met her husband-to-be, Ron. Joan received her Bachelor’s Degree from Wartburg College, in Waverly, IA. After she and Ron earned their Master’s Degrees from the University of Illinois, they both spent their professional careers in education in Naperville. After several years as a teacher, Joan founded a preschool, the School Readiness Center, in 1981. She was the school’s director until her retirement in 2004. After retiring, Joan split her time between Naperville and her favorite vacation spot: Siesta Key, FL. Wherever she was, she was usually accompanied by family, mystery novels, and Neil Diamond CDs. Services were private. Arrangements entrusted to Friedrich-Jones Funeral Home & Cremation Services. For more information, please call (630)355-0213. To send flowers or a remembrance gift to the family of Joan Elizabeth Gibson, please visit our Tribute Store. "Email Address" would like to share the life celebration of Joan Elizabeth Gibson. Click on the "link" to go to share a favorite memory or leave a condolence message for the family.